Can you believe its November?! It seems like the years are just flying by! Chicago already feels like winter and I’m so sad about it. Did we even have a fall?! If you find her, tell her we miss her! With the seasons swiftly changing it’s that time to adjust our hair routines. Dryer, colder climates result in lack of moisture for our hair as well as our skin. To combat the cold and retain moisture, many of us go into full protective style mode. Protective styles are convenient, time-saving and helps to retain length and moisture in the brutal cold months. Did I mention the cute options: braids, sew-in extensions, wigs, crochets, braided updos and more! Are you properly preparing your hair for protective styling? Many of us (myself included) tend to neglect our hair in protective styles. 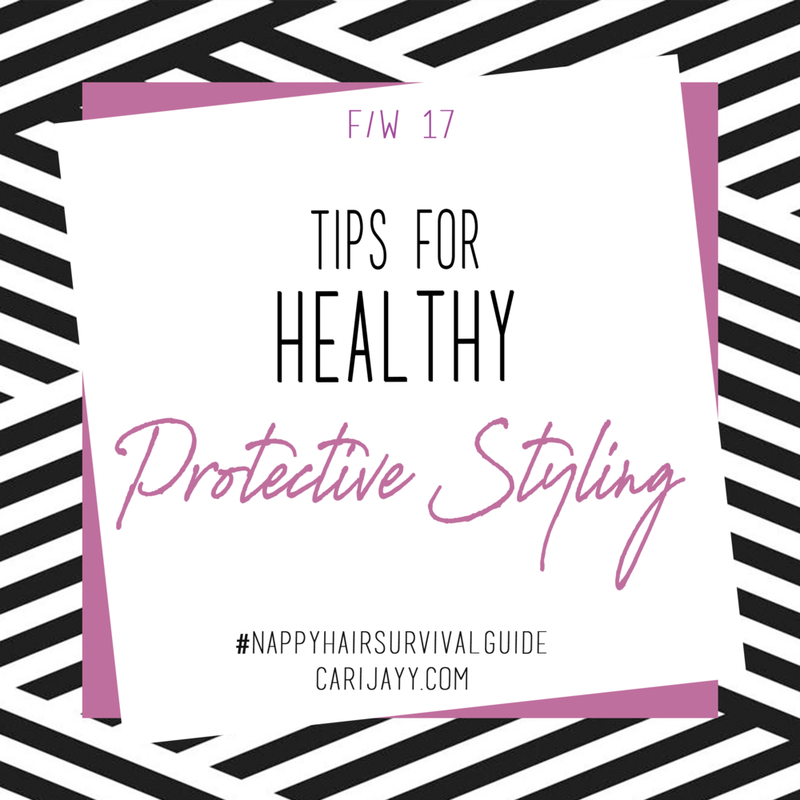 Since it’s tucked away, it becomes a matter of “out of sight, out of mind.” Don’t feel bad; I have a few tips for us all to receive the most benefits for our hair while protective styling. Visit the salon to receive what I call “protective style-prep services.” These services can include a detox cleansing shampoo, scalp treatment, deep moisture steam treatment, trim and blow-dry. This will leave your hair and scalp feeling refreshed, moisturized and ready for your choice of protective style. Adding moisture into the hair before putting it away will keep your hair from experiencing any breakage or dryness. If you seal away dry hair, you are only “protecting” dry hair. We don’t want that, ladies. This step maximizes your overall health and growth of your beautiful crowns. During Protective Styles Now that your hair is luscious and what not, it’s time for your style! There are so many options you can choose from. Whichever option you choose, I want to share these key points to keep in mind. Tension: Be mindful of the tension on areas such as the edges and the nape of the neck. Those areas the most likely to be affected during protective styles. Inform your stylist to not pull those areas too tight to avoid any hair loss. We like our edges, right ladies? Weight: Be sure to avoid protective styles that are too heavy. Too much weight can also cause hair loss, especially for those who have finer textures of hair. A good rule of thumb: Any length between collarbone and right below the breast region is the “sweet spot.” Moisture: Moisturize and treat your scalp during your protective styles as much as you can. Water, hydrating crèmes and soothing oils will aid in maximum growth. Most importantly, be cute! After Protective Styles After you have enjoyed your style, it’s time to remove them. This part can be tricky. I’ve seen a lot of women hair loss during the take down. We don’t want all of your hard work to go down the drain! Here are some solutions: Aim to remove styles within 6-8 weeks. The longer you keep them in, the more likely you’ll run the risk of losing hair. Apply conditioner to braids as you take them down. Once you have a small section of hair down, add more conditioner to your hair, detangle, twist and repeat until everything is removed. There will be shedding from the hairs that couldn’t naturally shed everyday but this avoids any premature shedding or loss during the take down. You can do an apple cider vinegar rinse on your scalp to remove any dirt and debris. Shampoo and deep condition and style like normal! You have mastered properly protective styling! You can enjoy your styles knowing that your hair will be in the best shape possible! If you are doing to perform back-to-back protective styles, give your hair a weeks rest. Your scalp will have time to regulate and relax from the previous style. Not allowing your hair to breathe can also result in dryness, breakage and ultimately hair loss. Unsure about what style is best for you, visit your stylist! Myself as well as other great stylist will help guide you in the best decision for your hair. I’ll list a few awesome stylists who are great as well! For the remainder of the year, I will be adding a new service to my menu to help prepare you ladies for those protective styles! It will be the “Protective Style Prep” service! This will include all of which I mentioned above: detox shampoo, scalp treatment, deep moisture treatment, trim and blow dry! You can book your service here! Looking for stylists who are great with braids? Here are a few options! Comment below and share what styles you will be rocking for the fall and winter!